Yields best in full sun. Part shade helpful when it’s hot. Tolerant of a wide range of soils, but prefers well-drained, cool, loose soil with plentiful moisture and pH 6.2 to 6.8. Sensitive to low pH. Lime to at least 6.0. Romaine (Cos) varieties tend toward upright. frost - Will withstand light to moderate frost. Hardened seedlings more tolerant than mature plants. not native to North America - Mediterranean origin. Was cultivated by Egyptians 6,500 years ago. Germination temperature: 40 F to 85 F - Seed can go dormant at high temperatures. Best germination is below 70 F.
Days to emergence: 7 to 14 - Germinates in about a week at 50 F, 2 days at 70 F.
Seed can be saved 1 year. 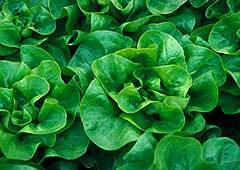 Browse lettuce varieties at our Vegetable Varieties for Gardeners website. Looseleaf (var. crispa) - Easy to grow. Matures quickly. You can start harvesting leaves as soon as 4 weeks after planting. Great for early-season plantings. Wide variety of leaf shapes and colors. 45 to 60 days to full maturity. Butterhead (bib, loosehead, Boston) - Exceptionally good flavor and quality. Forms loose heads with oily leaves. 55 to 75 days to maturity. Romaine (Cos, var. longfolia) - Upright, elongated heads. (Some grow nearly 2 feet tall.) More tolerant of warm weather and less likely to bolt than other lettuce types. Red varieties as well as traditional light green. Most take about 70 days to mature. French (summer crisp) - Midway between butterhead and crisphead. 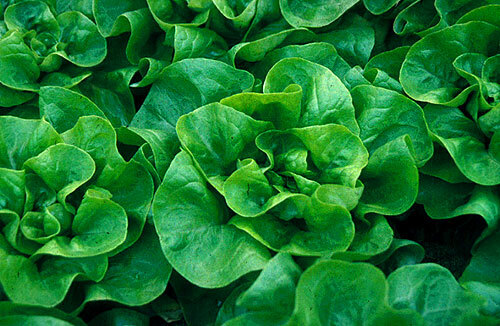 You can harvest early like leaf lettuce or wait until heads form. 50 to 75 days. Crisphead (iceberg, var. capitata) - The familiar spherical heads found in grocery stores. Most difficult varieties to grow. Requires long cool season. Best chance of success is by setting out transplants in early spring. Will bolt quickly in response to stress. 75 or more days. Choose slow-bolting varieties for later plantings that may encounter hot weather.